Last year I decided to approach New Year’s Resolutions in a different way: I would make a list of things to accomplish and to learn. I focused on just a few things that I enjoy, but seldom approach in a dedicated way: crafting, writing and cooking. My list included things I knew I could easily skate through the entire year without actually doing, unless I had something prodding me…like my pride. I printed out my list – in a big colored font nonetheless – and posted it around the house. That list lived above the sewing machine, by my desk and inside a kitchen cabinet door. Dye sock yarn with Kool-Aid. Cook one new recipe a week. 52 recipes. When I made this resolution I was actually thinking of the dozens of cookbooks I already own. Many of them were bought originally for just one or two recipes, while the other hundred or two pages go virtually untouched. I was also thinking, of course, of the internet and the wealth of recipes at my fingertips through magazine sites, foodie blogs, and SGT itself. And I was thinking that it wasn’t like I was aiming for 52 very intricate and time-consuming gourmet recipes. I would be counting things like a new peanut sauce for fried tofu, new brownie recipes, and new quiche filling combinations. For heaven’s sake, this was the first year I’ve ever served my family pigs-in-a-blanket! So, how did my resolution look in practice? I definitely did not have to branch out into truly exotic ingredients, (“You’re going to have to make some really weird things,” one friend predicted) or buy any new cookware (that my parents gave us an ebelskiver pan was pure – and delicious – coincidence). There were some weeks I used two or three new recipes and some weeks I didn’t use any. I admit that, after about March, when I had already tried 21 new recipes, I stopped tracking them so faithfully. Doing a CSA again this summer led to some new recipes and preparations. Given our location and climate, it is getting less and less likely that our CSA will bring us genuinely new vegetables, but sometimes the amount of a vegetable we get will lead us to new recipes. Thanks to the roughly two tons of pickling cucumbers we received, we did try a couple variations on refrigerator pickles and other new ways to eat cucumbers. The Relentless Cabbage Asault of 2011 also sparked new levels of experimentation. Beignet doughStill, looking back on my notes I see that several of the recipes we tried – the meatballs from Dinner: A Love Story, Dorie Greenspan’s Potato-Leek Soup, the Mangalorean Chicken Curry from 660 Curries, Deborah Madison’s Indonesian Fried Rice, the Sunday Sauce from Frankies Spuntino, Thai garlic and pepper beef, and the buttermilk beignets featured in the New York Times around Easter – were such hits that they were made multiple times in 2011. Indeed, that Sunday Sauce has proven especially addictive, and it doesn’t hurt that nearly a week’s worth of meals results from that one 6-hour investment. 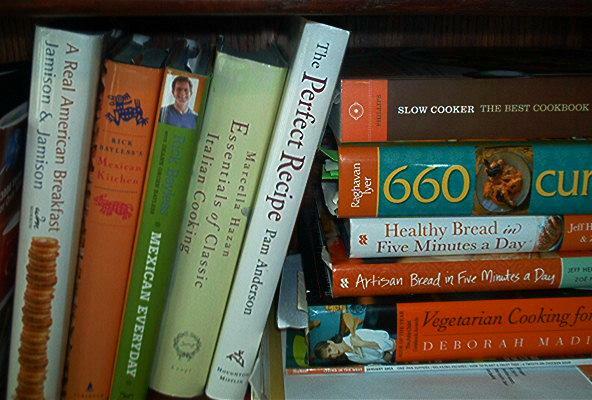 Cookbooks that were favorites before continued to provide excellent recipes. The most indispensable this year were: 660 Curries by Raghavan Iyer, Deborah Madison’s Vegetarian Cooking for Everyone, Everyday Mexican by Rick Bayless, Slow Cooker by Diane Phillips, Dorie Greenspan’s Around My French Table, The Frankies Spuntino Kitchen Companion and Cooking Manual, and Marcella Hazan’s Essentials of Classic Italian Cooking. I also found that reading blogs by other cooks – home, professional or foodie – often provided me with inspiration. Times when I might otherwise have been tempted to fill our menu with the familiar rotation of roast-pasta-tacos-soup-repeat, I would instead find at least one new thing to include in the line up. 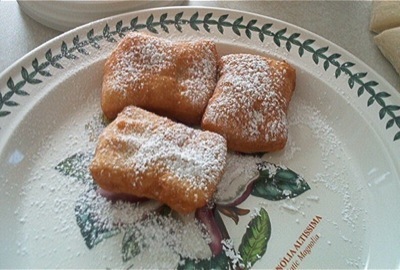 Finished beignets: one of the successes of the year.There were no outright disasters. There were meals that were disappointing, recipes that were marked as not worth the time after all, and one sad batch of pasta we judged to be too insipid to be worth eating as leftovers. 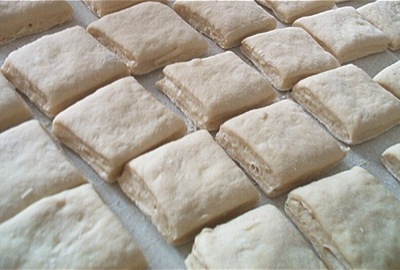 Some dishes were clearly going to be for the adults, while a more suitable pasta dish or sandwich would need to be made for the kindergartener, while other dishes were chosen with the youngster specifically in mind (for example, the beignets, pigs-in-a-blankets, and a new favorite, meatballs). Because I talked about my resolution as we planned our meals and as we ate them, the idea took hold. Recently, my daughter declared that she wanted the upcoming weekend to be "New Foods Weekend", where we would eat things we never had before. She wanted to start with poached eggs (thank you, Bread and Jam for Frances!). In fact, this resolution was successful enough that I am making it again for 2012. This is the beauty of a resolution like this – it can be made over and over because even if accomplished once, there still remains many untried possibilities! Plus, I noticed that this year for Christmas I received two cookbooks focused on pies. I am taking this as a sign – from my family as well as the Universe – that 2012 should be the Year of the Pie! Merie Kirby grew up in California, moved to Minneapolis for grad school, and after getting her MFA stayed for fifteen more years. She now lives in Grand Forks, ND with her husband and daughter. 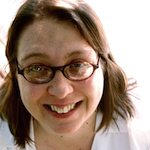 Merie writes poetry and essays, as well as texts in collaboration with composers. She also writes about cooking, reading, parenting, and creating on her own blog, All Cheese Dinner. Her most recurrent dream is of making cookies with her mother. This is an excellent dream. Her last artilce for SGT was Inventing Carrot Pie.